Back in the late 1990s, under private owners who didn’t have enough money to maintain the cemetery, the grass was long, tree branches were broken and lying on the ground, and — most damning of all — some grave plots were in danger of becoming part of the Red River. “He felt quite strongly about Elmwood Cemetery. It was an important place for him,” Norrie said of her husband. “His family had been buried there — his mother and father. His dad in 1958 and his mother in 1964. An older sister was also there. 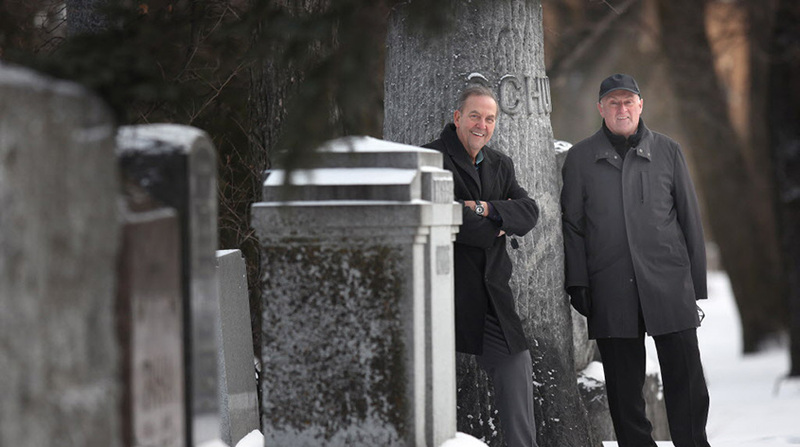 Wayne Rogers, the Friends’ executive director, said the cemetery’s disrepair was what sparked Bill Norrie, former city councillor and MLA Charlie Birt and retired accountant Bob Filuk to come together and create the Friends of Elmwood Cemetery in 1998. After negotiations between the owner, the city and the province, ownership of the cemetery was transferred to the Friends in 1998. “It has quite a history, and there are several prominent people and families buried here,” Rogers said, noting two provincial premiers, Rodmond Roblin and his grandson Duff Roblin, are there. “And that’s where I’ll be someday, too,” Rogers added with a laugh. Plans for the cemetery began in 1901, and once $50,000 was raised by the Elmwood Cemetery Corporation it was incorporated under the province’s Cemeteries Incorporation Act. The next step was to buy 15 hectares of land in what was then the Municipality of Kildonan, between what later became Henderson Highway and the Red River. The cemetery included a greenhouse, where people could buy shrubs and flowers to place by the plots, a mortuary chapel, a receiving tomb and a superintendent’s office. Thanks to non-stop fundraising, the cemetery has a larger perpetual fund than it has ever had and hopes to grow it even more. Jim Baker, the Friends’ chairman, said its fund stood at $4.7 million in September. “We’re working to build it so it is self-sufficient,” Baker said. “My wife and I will be there, too,” he said. Baker said a big part of ensuring the cemetery’s continued health is connecting with family members of people buried there. “We have generous donors now, but there are 50,000-plus people buried here,” he said. Rogers said decades after its creation, before the Friends stepped in, the cemetery’s perpetual fund had deteriorated and its grounds had fallen into disrepair. Added to that, the Red River was eroding the edge of the cemetery and putting some of the gravesites in peril. “They had to clean all the hanging stuff on the trees,” she said. “At one point, it was really gloomy-looking.